Yosemite, Natures Temple. In the midst of a whirlwind mini-vacation to a wedding in San Jose California and Southern California, we spent three incredible days in Yosemite. I have seen Yosemite Valley from the air several times flying from Portland to Los Angeles, but nothing prepared me for how incredibly beautiful and awe inspiring this spot really is. 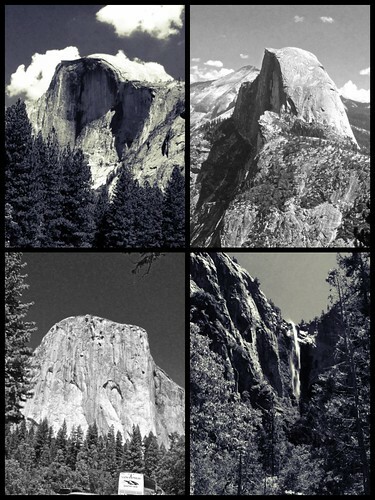 Black And White Yosemite Mosaic – A tribute to Ansel Adams. It was impossible to go here and not think of his photography, since he had photographed all over Yosemite and I have a print of his iconic Half Dome. 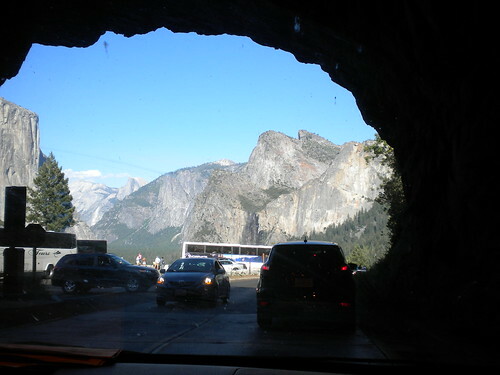 Tunnel View – The approach to Yosemite from the tunnel. This is another of Ansel Adam’s iconic vistas. Mine, not such good photography, but the view was breathtaking, nonetheless. This is our first view of Yosemite Valley with a view of Half Dome in the background. 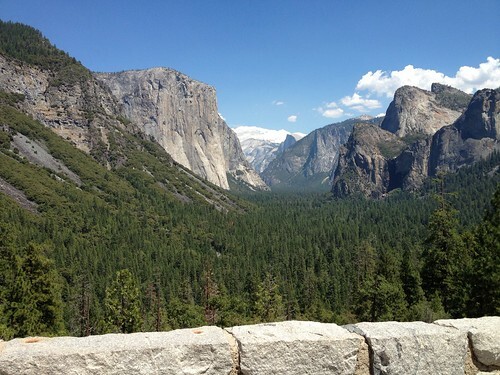 The view from the lookout point just beyond, gives us time to savor the beauty and grandeur of Yosemite. 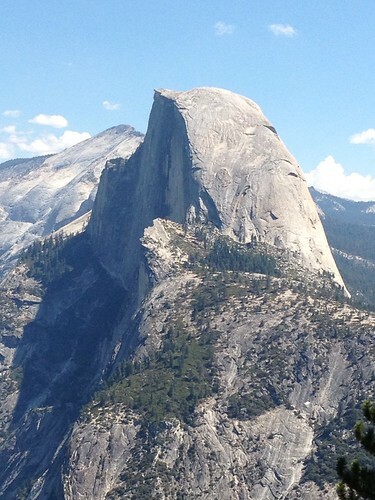 There is a view of both Half Dome and El Capitan with many other peaks of the valley. 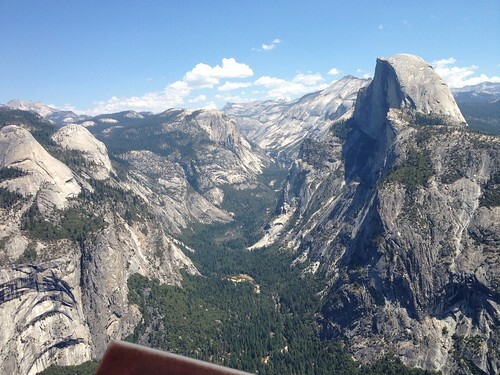 An incredible view of Half Dome and the Yosemite Valley from Glacier Point (an incredible lookout above the valley). This view is truly breathtaking. These next four are the originals of the photos I used for the black and white mosaic. Half Dome from closest point we could go by car. 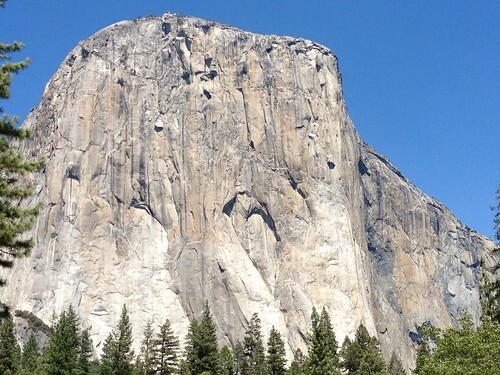 El Capitan from below. My crazy son wanted to get on the lottery to climb this. I’m so glad he didn’t. 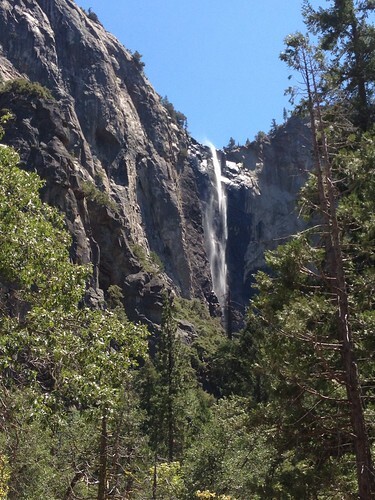 A view of Bridal Veil Falls from a spot the tour bus stopped. The wind whips the water at the top of the falls into a spray. This is August and many of the waterfalls were dry, including Yosemite Falls. Bridal Veil Falls was still flowing with this beautiful spray. We hiked in the next day, but the display wasn’t quite as nice. 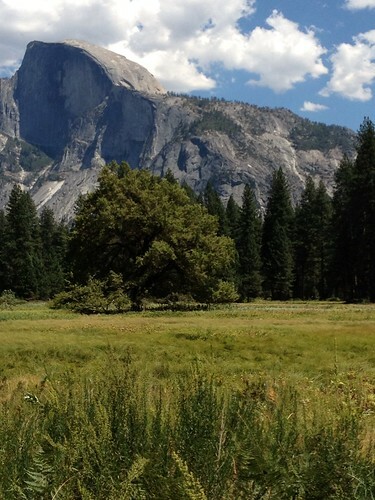 Meadow beneath Half Dome. The many meadows in Yosemite are truly beautiful, as was this one. Now for some of the Flora in Yosemite. Some of my identification is only my best guess or an ID of the variety but not the species. 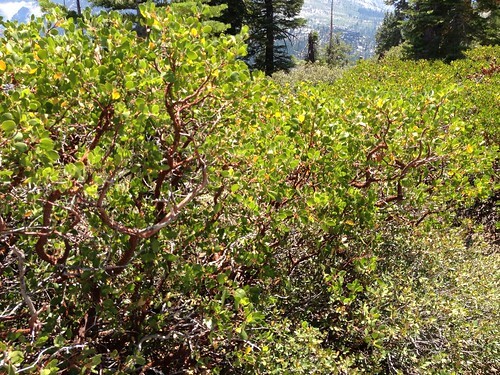 One of several varieties of Manzanita that I saw. 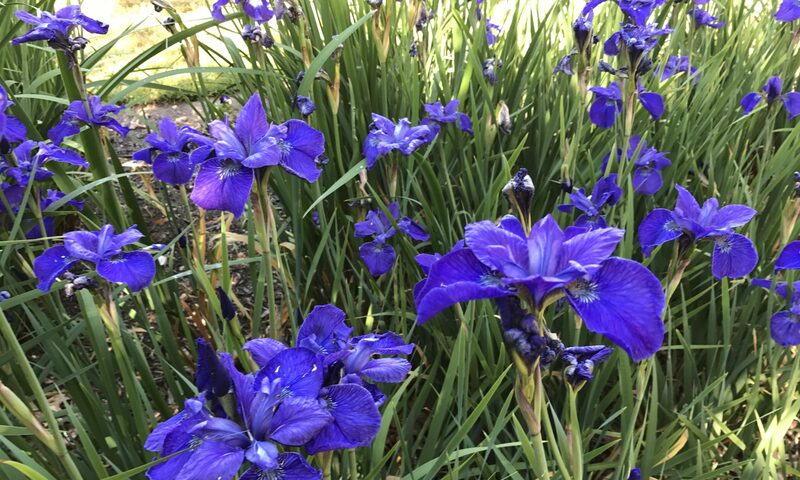 These are both beautiful and drought hardy. Some people are incorporating them into the landscape here in the Northwest. 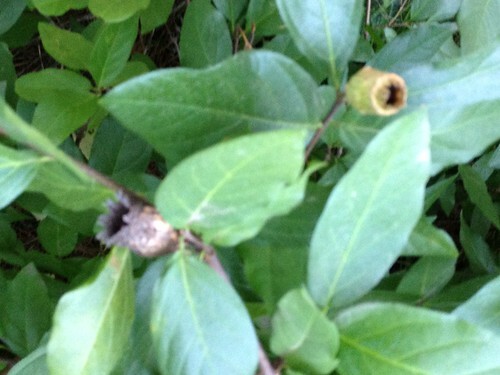 The picture is a little blurry, but I loved these seed heads. I have no idea what the plant was, but I liked it. 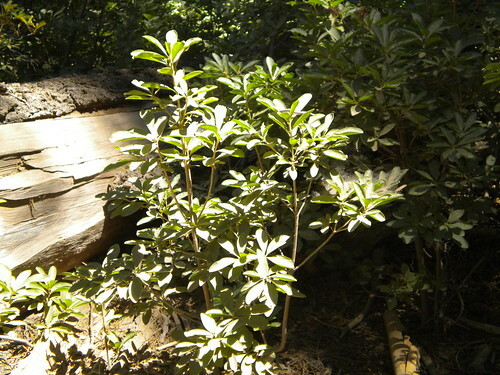 It looked a little like another Manzanita, but not quite. I think I may have found what this might be. In a book I purchased at Yosemite, I found a picture of a shrub called the Huckleberry Oak with leaves that look similar. Those seed heads just might be immature acorns. 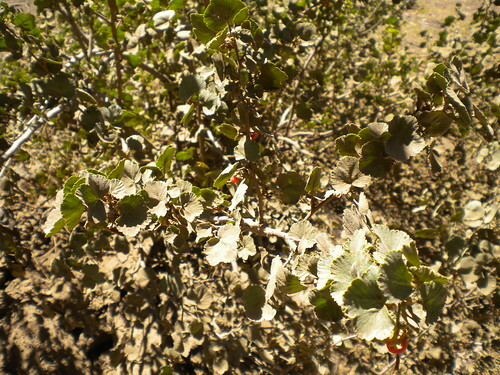 I think this was some variety of Holly. 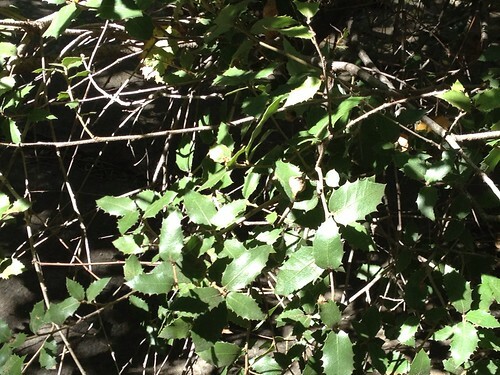 It didn’t quite look like Oregon Grape, which has a similar look. Probably the native Rhododendron or Azalea. I couldn’t tell which. 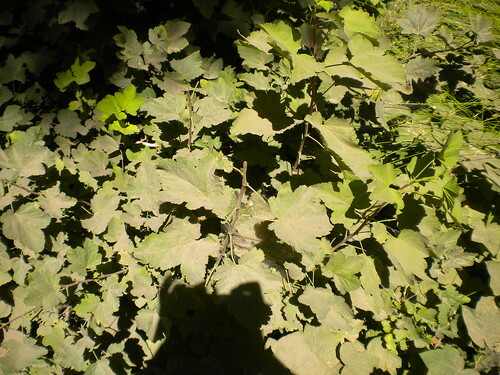 My guess is Thimbleberry or something related. And my guess on this one is the Sierra Gooseberry or something related. See the berries hiding among the dusty leaves. 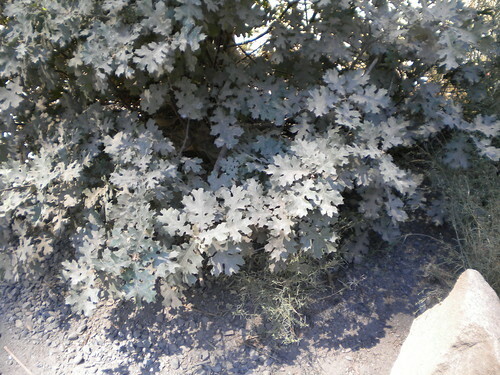 I believe that this is a young Black Oak. 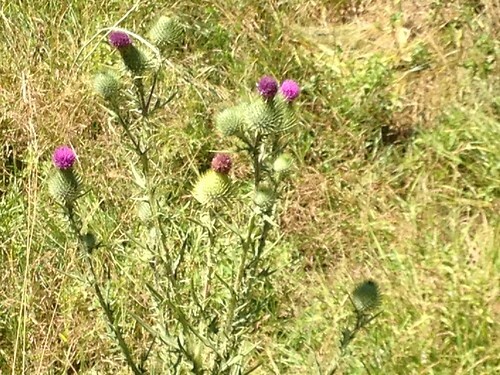 Thistle in one of the meadows. 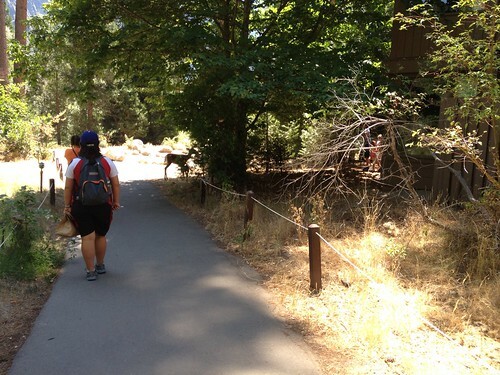 And now for a few of the Wildlife in Yosemite. No, we didn’t see any bears, but food has to be well stored in this valley. We saw a video of a bear hopping into a car’s open window to get food. 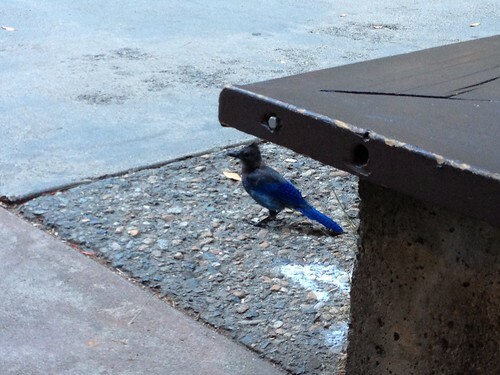 A beautiful Stellar’s Jay picking at crumbs near a park bench. I had lots of these when I lived in Washington. Here in Oregon, we have lighter blue Scrub Jays, which are also beautiful. I had never have gotten them by my house in Oregon until about an hour ago, I saw my first at our bird feeder while writing this post. I sure hope this is a sign of things to come. 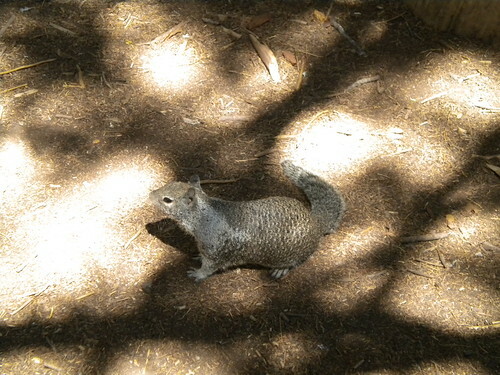 One of the ever present Squirrels. These are really pretty with their flecked coats.They are a little different from the Grey Squirrels that I see at home. We got quite a few pictures of this Doe and her Fawn (still with spots). This is the one that turned out best. You can see them at the end of this trail. And Sunset In Yosemite. A perfect end to three perfect days. Yosemite was truly an awe inspiring place. It was very hot (around 100), but wonderful. I am very proud of myself that I didn’t get dehydrated, since I am no longer used to that kind of heat. I would love to go back to do hiking in not so hot weather. We went to the Giant Sequoias too, but that is for another post. The views are breathtaking! I’ve not been there, but I can see I’d be amazed. Simply gorgeous! This is one place I would love to visit someday. Thank you for sharing your photos with us. They are beautiful. Thanks. It was a fabulous visit. I really want to go back again. I visited Yosemite back in 2002. It was paradise! Your pictures are stunning. They sure bring back memories. I’m so glad you got to spend time there. I have seen Yosemite and Half Dome from the air several times, but nothing prepared me for the total grandeur on the ground. It is amazing. Your photos are lovely and stunningly breathtaking. Thanks and thanks for coming by my site. It was truly incredible. Have a Shabbat Shalom and a good weekend. What stunning shots! I hope one day I get to go there. Thanks and thanks for coming by. I really did love it. It is an amazing site. I hope that you do get to go some time. Thanks and thanks for visiting. It is truly beautiful. I would love to visit one day! Your photos are beautiful! Thanks. Glad you could come by. It is indeed awesome. I have seen so many photos from all different sites in all the seasons. I am glad to finally have gotten to visit. I am ready to go back again. Thank you. The scenery is amazing and fantastic. Hoping that you have a good weekend. It’s absolutely breaktaking in the photos so to have actually been there must have been wonderful! It was so amazing. No photos could have remotely prepared me for how truly beautiful it really is. Thanks for hostessing. It was a wonderful experience to have been. I hope that you do manage to get there, because we had an awesome time despite the heat. Hoping that you have a great weekend. Thanks for coming by. I was amazed at how accessible it was from the Bay Area where my brother lives. We drove over in about 4 hours and were astounded at how incredibly beautiful it is. How nice to have something so wonderful that close. 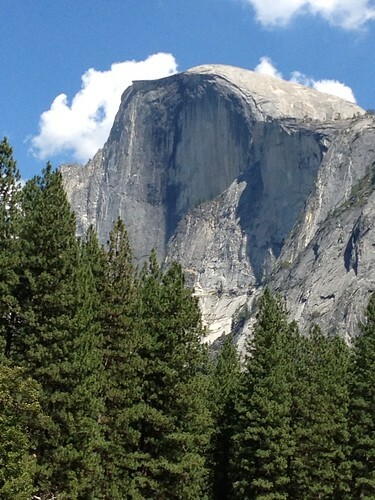 Thank you for sharing these beautiful pictures of Yosemite. I live only a couple of hours away, but haven’t been there in many years. That needs to change!! The beauty is so breathtaking!! Yes, it is stunning. By all means, return. I was only just there and I want to go back already. I’m so happy for you — such grand creations of nature that you witnessed and shared — thank you. Thanks and thanks for coming by. It is truly a grand place to be. Hope you have a great weekend. Lovely photos! I’ve never been to Yosemite, but it’s high on my bucket list. Thanks for coming by. Yosemite is truly amazing. You would love it if you get a chance to o. Thanks, Katherine. Thank you for hostessing. Very beautiful! Hubby and I have often thought of going to Yosemite. Why, oh why have we not made it there yet? Definately going to sometime. Thanks for sharing the beauty of God and Mother Nature with Share Your Cup. It is truly a wonderful place, even at 100 degrees. I loved the time we spent there. Absolutely wonderful…I really have to visit there someday! Good to see you again. We truly had a wonderful time. I think you would really enjoy it if you did get to go. We saw the giant Sequoias too which are a part of the park. Come back for that post, which I will probably do on Sunday or Monday. Yes it is very beautiful, but also scary! They are already very very old!